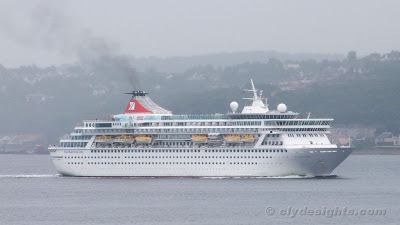 On July 21, another of Fred Olsen's fleet of ships visited Greenock for the first and only time this year. BALMORAL, seen departing in dismal afternoon rain, was on a Round Britain cruise that started at Dover on 17 July and called at Guernsey, Dublin and the Isle of Man before heading north to the Clyde. After her Greenock visit she was continuing to Kirkwall, Invergordon and then back to Dover. BALMORAL started life in 1988 as the Greek cruise ship CROWN ODYSSEY, owned by the Royal Cruise Line. Built by Meyer Werft at Papenburg in Germany, she was originally 187.7 metres in length and had a gross tonnage of 32,242 tons. As built, she could accommodate a maximum of 1,230 passengers. In 1996, she was renamed NORWEGIAN CROWN following a transfer some years earlier to the Bahamas-based Norwegian Cruise Line. April 2000 saw her reverting to her original name, which she retained for a further three years before - yet again - becoming NORWEGIAN CROWN. In 2006 she was sold to Fred Olsen who took delivery of her the following year, drydocked her in Germany, and fitted a new 30-metre long midship section, giving her a new overall length of 217.9 metres and a gross tonnage of 43,537 tons. 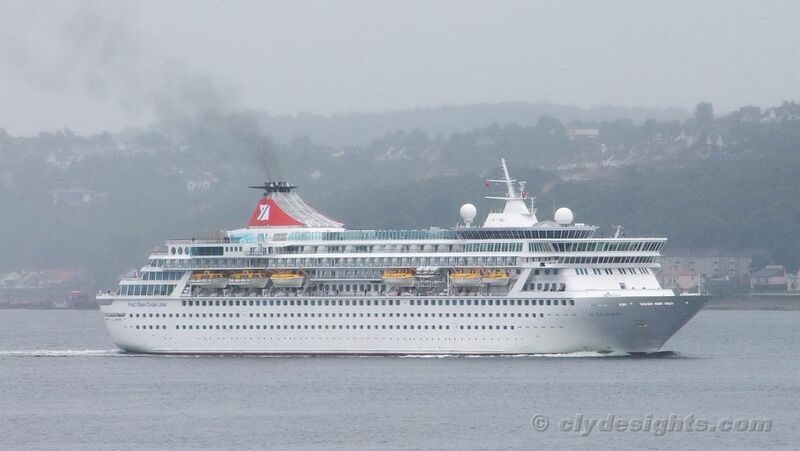 Following renaming, she entered service as BALMORAL in February 2008, now able to carry up to 1,778 passengers.